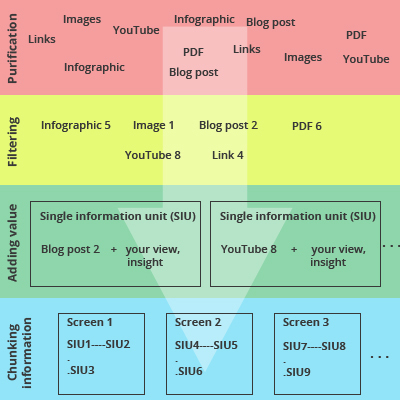 Microlearning / What Content Curation, Chunking Information and Micro-learning have in common? In this article I’ll present a framework that could help educators to make a shift from designing long, information based online courses to micro-learning, which is a result of content curation techniques and chunking information design strategy. It was a long time ago when I started combining different ideas in my head about how future online learning would look like. The main driver for these kinds of thoughts was the feeling that something should be done for enabling a better online learning experience. That feeling emerged, when I was involved in some projects where we had been developing self-paced online courses. These courses were information based and when the project was finished I was sure that many won’t complete the course without making several short naps during its use. Then one day I was surfing the web, looking for some good blog post on eLearning and found this one by Ryan Tracey - Online courses must die! The statement - “Online courses must die because they are unsustainable in the modern workplace. They aren’t rapid, flexible or scalable, and they usually don’t take full advantage of their medium anyway.” - forced me to think even harder to find a possible solution for better online learning. This was at the beginning of year 2011 (I can see this because Ryan’s post was clipped into my Evernote at that time :D).Today I don’t have the solution. But what I do have is an outline of a framework, which helps me when I have to prepare online learning materials for my learners. And I want to share this outline with you to see if anyone else also uses it, because I’m aware that it is actually nothing new. When I’m wandering on the Internet and find something interesting, then the first thing I usually do is saving the source into my Pocket account. I call this phase “purification”. Then when I have some calm moments, I go through my Pocket list and save useful sources into my Evernote account. This phase is called “filtering”. I found that roughly 10% of sources ended up in Evernote. Next step is to prepare learning materials for my learners. The easiest way would be to share my Evernote links with them but for me this is not enough. I’ve recognized that by using content curation techniques I’m able to enrich those links/sources with essential facts/insights, which results in a far better understanding on learner’s side. The combination of the link/source and the fact/insight is a single information unit (SIU) and phase is called “adding the value”. 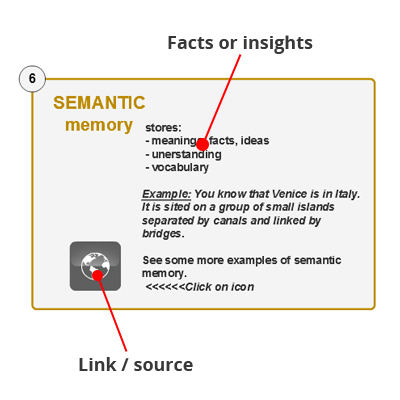 Because I don’t want my learners to be overwhelmed with all my information units at once I define how many information units should I put or link together on one page/screen in order to maintain the meaningfulness and not to overload the learner’s working memory. This phase is final and is called “chunking information”. What the learner gets is a set of several short-learning episodes instead of a well-known and many times too long online course format. This is called micro-learning which frankly isn’t anything new. We all tend to acquire new information in a short, “light” way. 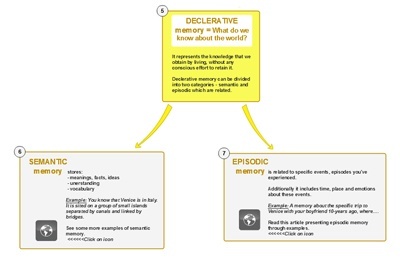 The notes taken during the meeting or lecture that are later reviewed, is one of the most common micro-learning activities. However, in terms of instructional design, micro-learning is an output of the process, where an educator invests his time to collect, curate and present small information units into a digestible whole.